The dashboard feature enables privileged users to view and monitor ongoing sessions, enabling administrative oversight to help manage staff. Based on roles assigned from the Teams page of the administrative interface, team leads can monitor team members of a given team, and team managers can monitor both team leads and team members of that team. If a user is a team manager or team lead of one or more teams, selecting one of those queues causes the dashboard pane to appear beneath the queue selection pane on the Home tab of the console. In this pane appear any logged-in team members of a lower role for the selected team. Select a user from the dashboard pane to view any sessions they may be running. A team manager or team lead can take over a session from another user of that team by selecting the appropriate session from the queue and clicking the Take Over button. This transfers ownership of that session to the team manager or team lead, with the original user remaining in the session as a participant. Additionally, if configured in the /login interface, a team manager or team lead can monitor team members of a lower role even if there are no ongoing sessions, as long as those user are logged into the console. 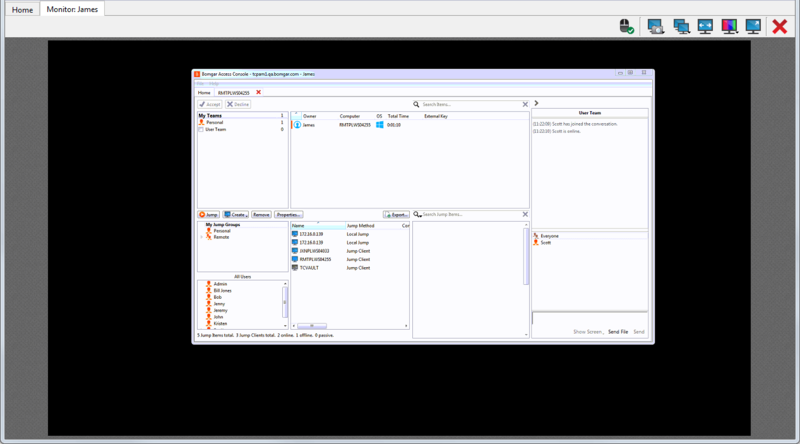 An icon signifying monitoring is displayed in the corner of the user's desktop to indicate that monitoring is taking place. When the user moves the cursor near this icon, it moves to another corner to prevent obscuring the screen. Select the user whose screen you wish to view and then click the Monitor button. This opens a new tab in your console, displaying the user's console. To gain control of the user's computer, click the Enable Mouse/Keyboard Control button. Within a team, a user can administer only others with roles lower than their own. Note, however, that roles apply strictly on a team-by-team basis, so that a user may be able to administer another user in one team but not be able to administer that same user in another team.